Things fell into place for game mare Zazparella at Warrnambool on Sunday, the consistent five-year-old for the first time since last winter striking her favoured heavy conditions. As the rain fell we grew more confident of her chances in the Francis O'Rourke Memorial Handicap and it was the same for punters who sent her out equal favourite in the 2350m event. And she gave them no cause for concern, always travelling well outside the leader for Jake Bayliss and giving a good kick after taking the lead approaching the turn. Saluting by a soft 3/4 length, Zazparella recorded the sixth success of her 39 start career, one that has seen her amass over $190,000 in stakes. "It did look the right race for her," Michael Moroney said, adding that it was a shame that the daughter of Al Maher did not strike more rain affected tracks during her career. "On the right sort of track she was capable of earning black type," he said. Booked into young sire sensation Zoffany, Zazparella will race on through the winter with Moroney confident that she has more wins in store. 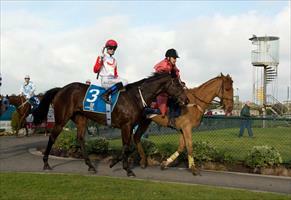 Part owner Neale Donnelley was on course on Sunday and delighted by his mare's success. "It was a great ride by Jake and she did the rest," he said. "We have been waiting for months for her to get the right sort of track - our only worry today was that they'd get too much rain and call the meeting off!" "She has been a terrific mare for us," he added - "she has done a great job." Jake Bayliss, having his first ride on Zazparella, was confident throughout the race. "She had been knocking on the door," he said. "She had an ideal run, they really started rolling along from the 1000m which she liked and she was definitely the toughest stayer out there." Congratulations to owners by Karen Glindemann, Neale & Gaylene Donnelley, Steve Moran, Gregory Griffiths, Lyn M McCain, the Runs Wins Syndicate (manager Simon Fitzpatrick), the S & H Carter Syndicate (manager Stephen Carter), Stuart & Julie Quinn and Kariba Racing Pty Ltd.
We have a relatively quiet week following on from the winning weekend with just two runners on Wednesday - Court Pastoral and The Bunsta both heading to the mid-week meeting at Warwick Farm. Another mare booked into Zoffany, Court Pastoral has been somewhat disappointing of late but Moroney hopes that she may improve around the Sydney way of going. "She can have a couple more runs before she retires to stud," he said of the imported daughter of Mount Nelson. Whilst his run of bad luck with tricky barrier draws continues, The Bunsta does look a genuine chance of measuring up to this grade off the back of solid provincial form. Racing well on pace, the Pentire four-year-old is a horse who will probably be better ridden more quietly with cover but he has been forced to work forward from less than ideal gates of late. "I think later he will be better over further with the blinkers off but whilst he is going well we will leave things as is," Moroney said. "Hopefully there will be a bit of pace on and he can get that cover as I think he is up to this sort of class at least and he can prove competitive."